Asian equities fell on Thursday, April 12, as investor confidence weakened overnight amidst geopolitical tensions. In Japan, car manufacturers and the oil industry collapsed. Hong Kong has a strong energy sector, which was boosted by rising oil prices. The financial sector was mostly downward. In South Korea, exporters and most of the technology sector were on the rise. US stocks fell on Wednesday, April 11, after President Trump launched his latest message on Twitter. It incites Russia to prepare for a possible missile attack on Syria. Trump said: 'Russia promises to shoot down every single missile fired at Syria. Get ready, Russia, because they're coming, nice, new and intelligent. You shouldn't associate yourself with an animal that gasps its own people’. At their most recent meeting, Federal Reserve delegates noted that the economy was growing strongly and that inflation was also rising. This justifies an increase in interest rates. The minutes of the March meeting showed the central bank very hopeful about the direction in which the economy is headed, albeit with some hesitation. The summary of the meeting indicated that all participants expect the economy to strengthen and inflation to rise in the coming months. The Dollar rose against the Yen on Thursday's Asian trading session. Investors took refuge in safe haven currencies such as the yen as a result of the possibility that the West will take military action against Syria. Oil markets remained tight on Thursday due to concerns about a military escalation in Syria. However, prices were far from their highs on Wednesday, when a significant increase in American oil reserves was announced. On Thursday's Asian trading day, gold climbed to several week highs as the pace of interest rate hikes in the U.S. is expected to increase. In the session of Wednesday, April 11, it was noted that inflation maintains a constant growth of 0.2%, without the volatile prices of gasoline and food. This is expected, but in the year-on-year it accelerated from 1.8% to 2.1%. Overall, the real exchange rate of the CPI is -0.0629 and the underlying is moving at +0.1756. Wages improved by +0.4%, better than the expected +0.2%, an important inflation point. It's the first monthly drop in ten months. 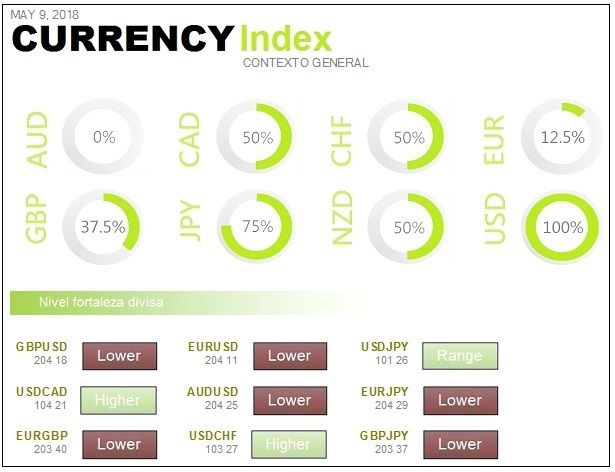 At the moment, the short-term data is negative for the dollar, positive for bonds and slightly negative for the market. Tension is rising in Syria. The World Health Organisation noted on Wednesday 11 April that 500 patients are suffering signs of exposure to chemical weapons. Knowing that the airlines have been warned not to approach the area in the next 72 hours, France's reflections and the United Kingdom's willingness to weigh up all kinds of actions mean that everyone is waiting for a possible US initiative to respond to this situation. Saudi Crown Prince Mohamed bin Salman is taking advantage of his official visit to seek investment and boost his Saudi economic plan Vision 2030. Saudi Arabia wants to revolutionize its economy. The Crown Prince of Saudi Arabia arrives with the aim of presenting his national economic stimulus plan, the Saudi Vision 2030 project, which addresses a profound social and economic reform. One of its main goals is the creation of the largest sovereign wealth fund by 2030. Mohamed bin Salman wants to engage Saudi Arabia in a new era of greater openness at all levels. The Saudi economy, dependent on oil, through its state-owned company Aramco, will be turning the spotlight on new sectors. The Vision 2030 project represents a revolution in the economic, social and cultural spheres, and presents numerous opportunities through concessions and public-private partnerships in sectors such as infrastructure, tourism, entertainment, public transport, defence and renewable energies. ‘We want to build long-term partnerships with partner countries, with the aim of sharing knowledge and boosting trade'. Weekly oil reserves increase by 3.3 million barrels, when a decline of almost 200,000 was expected. This is a fairly sharp change of direction from the 4.61 million barrel decline of the previous week. With respect to distillates, there is a decrease of 1.04 million and is ahead of last week's increase of 527,000 barrels. Regarding gasoline, there is also an unexpected increase. It goes up 458,000 barrels, nothing to do with the expected 1.42 million drop. The data is negative for the price of crude oil. The European Commission has proposed a package of measures. The aim is to strengthen consumer rights in cases such as the 'dieselgate' or the ground clauses. Asian equities traded mostly higher on Friday, April 13, and investor confidence improved amid a slowdown in recent trade and geopolitical tensions. In Japan, financial and material stocks rose. Major exporters, including car and technology manufacturers, also improved amid the rise of the dollar against the yen. South Korea's Kospi is helped by a strong rise in the technology sector. Positive sentiment was also observed in Australia, with health care and materials being among the best performing sectors. China's exports in March fell by 2.7 percent, below expectations. Imports in dollars rose by 14.4 percent, exceeding the projected 10 percent increase. Trump said he is considering rejoining the Asia-Pacific trade pact again, despite keeping his campaign promise to withdraw from it shortly after taking office. He also expressed confidence that the United States is moving toward a resolution of a trade dispute that began with China, which included a threat last week to impose $100 billion in additional tariffs on Chinese products. American markets rose sharply on Thursday after President Donald Trump clarified his position on a possible missile attack in Syria. The banks' shares led the profits, with J.P. Morgan Chase, Citigroup and Goldman Sachs up more than 2 percent. Profits are expected to grow 24 percent in the financial sector. The Russians were subjected to harsh threats after Trump's angry tweets about the missile attacks in Syria. With the United States showing no signs of regressing, Vladimir Putin seems to be doing so. Trump tweets with this message: `I never said when an attack on Syria would take place. It may be too soon or not too soon. In any case, the United States, under my administration, has done a great job in ridding the region of ISIS. We must thank America'. Dollar rises broadly. 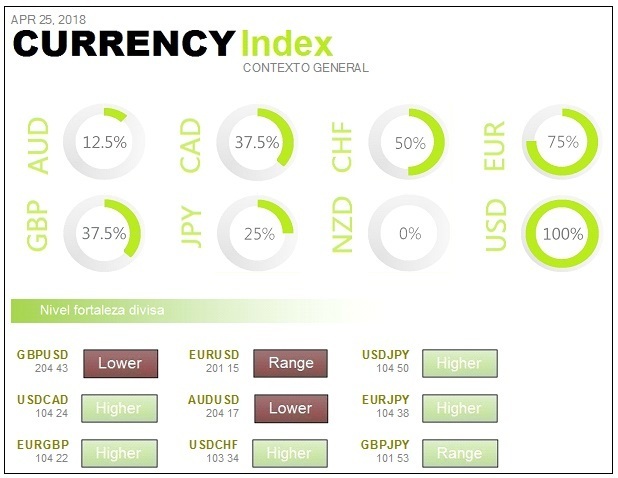 The Dollar rises against most of its major currency pairs on Friday, as risk appetite increased in equities and as a result, U.S. bond yields rose sharply. Oil prices fell on Friday, but have now reached their highest weekly gains since July, after a peak of more than three years, reached earlier in the week, due to tensions over Syria and falling global oil inventories. Gold prices rose in Friday's Asian session after registering its largest percentage decline in more than two weeks in the previous session. He was on the verge of a small gain, for the second week in a row, amidst tensions in Syria and the trade dispute between the United States and China. The world's leading stock exchange revaluated by around one percentage point on Thursday 12 April, showing how volatile US equities are. Trump is once again defusing tension with Russia. Once again we see, with the help of Tweet, the way Donald Trump does things. Wednesday was a very busy day with everything the President of the United States published and the point is that there is a certain modus operandi. At the moment there is a great deal of threat and a great deal of danger, in the short term, following the comments. However, in the end it seems to make a break by reaching out to force negotiations. Reading of the minutes of the European Central Bank. 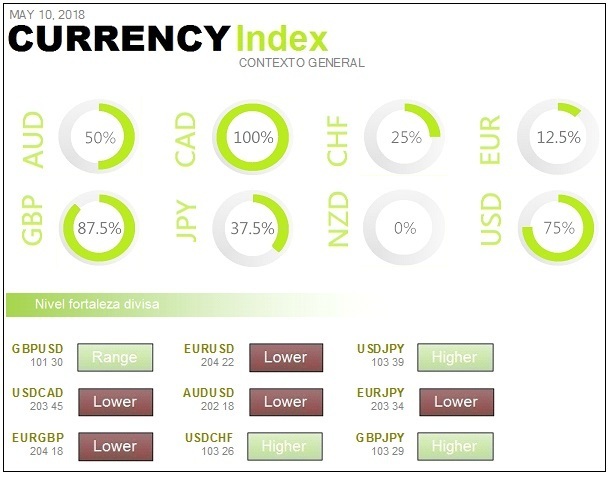 They have shown that there is concern about the level of the euro, although they say that in the past an increase in the price of the single currency did not affect demand. However, it would damage the inflation outlook. European stock markets where holding back on Thursday 12 April, with the euro at $1.23 and the Brent at around $72. Some relief was beginning to be felt because the tone of the U.S.-China threats had subsided. The latter country has taken the initiative and begun to open up even more to the market to show itself as the antithesis of Donald Trump, accepting more foreign capital and lowering tariffs, something that could compensate for the damage to trade caused by US isolationism. However, the real war, the one that makes people suffer, takes centre stage. We have already seen that the situation in Syria has been unstable for too long and there are two clearly distinct sides intervening in the situation, both directly and indirectly. On the one hand, there is Russia, which is supporting Syria, and which is also supporting Iran, in a place that could help increase pressure on Saudi Arabia, an ally of the United States. The recent chemical attack is what's triggering all the rage. The international community finds this unacceptable. The United States gave itself 24 hours to decide whether to intervene militarily in Syria and the airlines appear to have been warned not to enter the area in the next 72 hours because something could happen. Russia has raised the tone, several Members are going to meet with Assad, and he has also said that any missile approaching the area in Syria will be shot down and the sites of its launch will be targeted. The point is that if these missiles are launched from aircraft carriers, cruisers, destroyers, or submarines, it is not known whether these devices would be qualified as targets, so we would be talking about a direct threat to Western units from Russian units, which would be almost a direct conflict. The market is very frightened about this issue because it is something that nobody likes, especially because of the confrontation between the sides that could end up in something much more powerful. Gold prices rose sharply on Wednesday after renewed geopolitical tensions between the U.S. and Russia led the price to hit annual highs. For the time being, gold has slowed down dryly due to its resistance to annual highs. But it is no less true that overcoming this resistance would leave the door open to the possibility of looking for the resistance zone conferred by the upper part of the bullish channel, now nearing 1,400 dollars. In any case, what is really important is that, apart from corrections, the increasing minima and maxima are still there. The price of crude oil is slightly below 67 dollars a barrel. There is also news from OPEC because, after presenting their monthly report, they say they would be willing to take the agreement to reduce production beyond 2019 and even if the surplus of crude oil reserves were to be eliminated. Therefore, it seems that they still see the remarkable increase in production in the United States as a major enemy, so they are fighting directly against that production. Asian markets traded mixed on Monday 16 April, with investors digesting geopolitical tensions following the US air strikes on Syria. In Japan, the financial sector was the weakest, while pharmaceuticals and stocks of precision machinery contributed to the overall gains. The panorama of technological actions in South Korea was mixed. In Australia, energy and utility stocks are among the highest performing. Hong Kong's Hang Seng index fell as the financial and technology sectors were affected. U.S. equity index futures were trading higher during Asian trading hours, but they had held back some of the strongest gains seen earlier in the day. However, markets remained largely calm after the US-led precision missile attacks on Syria. The launches, carried out jointly with the United Kingdom and France, were intended to deter the use of chemical weapons. The air strikes so far have only provoked verbal condemnation by Russia... But with the threat of 'global chaos' if the West strikes Syria again. There does not seem to be much fear in the markets about the current situation. At least judging by the limited movements in the forex market in the first two hours of the new trading week. The Dollar rose to a two-month high against the Yen. The Russian oligarchs could be causing the Swiss franc to fall. 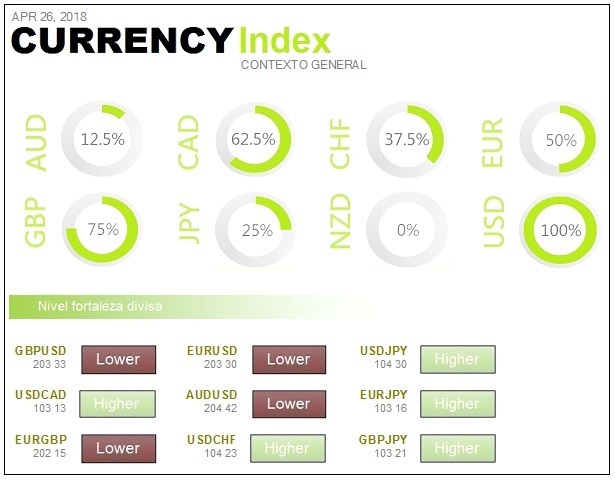 The sharp decline in the currency last week put an end to its reputation as a safe haven asset in times of market turmoil. Oil prices fell on Monday as markets opened the week cautiously after Western air strikes in Syria over the weekend, and as U.S. drilling continued to rise. During Monday's Asian session, gold prices rose, despite the dollar and stock markets reaffirming their belief that the weekend's missile attacks on Syria by the United States, France and Britain could be an isolated event. It is necessary to be very attentive to the behaviour that is going to take place in the environment of the average of 50 sessions. This average has a negative slope. It is vital that it goes up to try to stop the bearish cross with the 200, which would not be positive for the market. The Dow Jones Transport and Dow Jones Industrial averaged 200 sessions on April 13 and sales have appeared. At that very moment, the three successful bank stocks JP Morgan, Wells Fargo and Citigroup turned sharply downwards. Also at the same time, the Russian Vice-President said that they would do everything possible to increase the production of metals and to prepare limits on imports of products from countries that imposed sanctions on them. Therefore, the trade tensions between the United States and China are compounded by those between Russia, which is a similar situation to the sanctions imposed by the annexation of Eastern Crimea. A preliminary reading of the consumer confidence data, created by the University of Michigan, has been released. It has been worse than expected both in the overall figure and in the current situation and also in the outlook. It's the opposite of what you need to see right now. Prior to the opening, Rosenberg of the Federal Reserve said they may have to increase the number of interest rate hikes more than expected. Currently the plan is for three increases in 2018 and three more in 2019. In Europe, the inflation reading for March has been released. In Spain it is still not far from 1% year-on-year. Germany is at 1.6%, underlining the European Central Bank's perception that patience is needed to reach the inflation target zone. Political uncertainty in the Middle East has re-emerged. The expectation of the next steps in Syria and Yemen has helped boost the price of Brent crude to over $70 a barrel. It remains to be seen whether prices will be maintained and what the implications are for market demand and supply dynamics. The International Energy Agency's overview of global supply and demand growth in 2018 has not changed since last month. On the demand side, in early 2018, stronger growth in the United States was partially offset by weaker growth in China. Globally, demand for oil is expected to grow in 2018. However, there is an element of risk for this perspective. It is due to the current tension over the tariff war between China and the United States. JP Morgan, Citi and Wells Fargo, among many others, publish results. It is very important to see how the market takes these results. For the time being, it is not precisely the banking sector that is benefiting most from the tax reform. Another very bad fact about industrial production. It is difficult to recall a single favourable figure in the eurozone and it is still thought that the peak of the economic expansion cycle has been left behind. Despite the fact that the European Central Bank does not recognise this at the moment. Probably because political reasons. International relations should not depend on the mood in which a single person in the world wakes up every morning. As an example, Trump now says he wants to reactivate the Trans-Pacific Treaty that he himself discredited. Most Asian markets fell on Tuesday, April 17, as investors digested a better-than-expected Chinese data release. On the other hand, the Dollar remained stable after investor confidence rebounded and concerns about the geopolitical situation faded. In Japan, the oil sector recorded gains amid the declines observed in most other sectors. China's markets fell after the release of Tuesday's data, but slowed some of the sharpest declines seen during the session. China's economy grew by 6.8 percent in the first quarter of 2018. The figure exceeded the estimate of 6.7 percent expected annual growth. On Monday, April 16, U.S. equities rose as fears about the conflict in Syria eased. The major U.S. companies published encouraging quarterly results. Investors were watching the corporate results after Bank of America reported better than expected quarterly results. The season has got off to a good start so far. Last week, BlackRock, J.P. Morgan Chase and Citigroup reported better than expected earnings. Donald Trump accused China and Russia of devaluing their currencies, breaking with the opinion of their own treasury chief. According to Trump, 'Russia and China are playing the game of currency devaluation while the United States continues to raise interest rates and this is not acceptable’. His comments on China contradicted a half-yearly report by the Treasury Department that refrained from naming any country as a currency manipulator, based on specific criteria. Russia is not among the twelve largest trading partners assessed in the report. During Tuesday's Asian trading session, the Dollar remained stable, while the market's focus was on U.S. trade policy. Oil prices rose on Tuesday amid concerns of a high risk of supply disruptions due to the potentially expansive conflict in the Middle East, the renewal of U.S. sanctions against Iran and the drop in production as a result of the political and economic crisis in Venezuela. Gold price rose on Tuesday, with a stable US dollar. Gold bars are now less expensive for holders of other currencies. Difference in behaviour between Europe and the United States. In the joint session on Monday 16 April, the United States did much better than Europe, which was almost entirely negative. 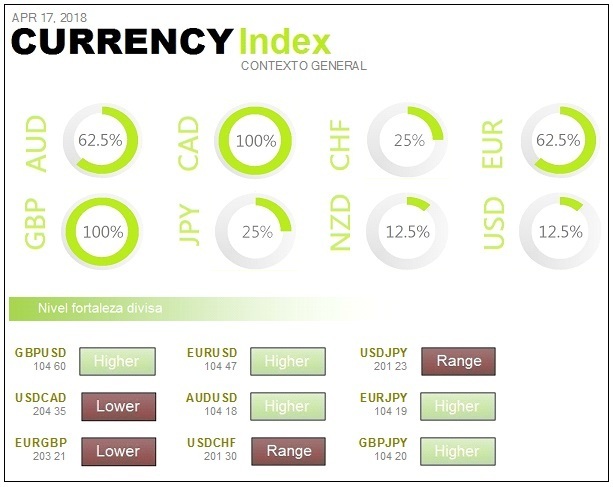 We have to look for the reason in the behavior of the dollar, since its general index, the one that represents its quotation against a basket of values, was decreasing and that means that it exports strength to other currencies. The euro has found extra strength and to explode upwards is bad news for exporters and the European economy. With this, the European automotive and parts supersector is one of the worst of the day. Retail companies have benefited slightly. U.S. retail sales data have been known to improve more than expected, thanks to increased demand for cars. Kaplan in 2020 sees that growth in the United States could be less than 2% as government stimulus is lost and with more restrictive monetary policy conditions. The price of crude oil has not stopped falling. Both the benchmark in the United States and Europe. So the oil sector has been one of the worst hit. At the end of the session, most supersectors in Europe are in negative. Only those who have benefited from specific factors, such as airlines, travel and leisure, have been spared precisely because of the decline in oil prices. U.S. retail sales increased 0.6% in March, after a decline of 0.1% in the previous month, according to the Commerce Department. This is positive for the economy, supporting the Federal Reserve, positive for the dollar, negative for bonds and slightly positive for the market. Although remember that the yield on 10-year debt is again approaching 3% and anything that accelerates the economy can make the market nervous. Remember that the University of Michigan's reading of consumer confidence, which was released last Friday, was disappointing and downward. There is great concern about consumer behaviour. The employment rate of the Organization for Economic Cooperation and Development stood at a record high of 68 per cent in the fourth quarter of 2017. It is two tenths above the reading for the previous three months and its highest level since the beginning of the series collected by the Club of Rich Countries. The CFO has said that the European Central Bank has asked it to estimate the potential costs of ‘closing its trading branch in the markets’. At the moment Deutsche Bank's value is falling by about -0.9%. They have already rushed to say that it is only an analytical exercise in a hypothetical scenario and has nothing to do with anything else. This is the first bank to be asked for this information and the rest will follow. They have asked them first because they are the largest on the capital market. The conclusion of the study will come at the end of the year, so it is still too early to talk about any kind of involvement. Geopolitical tension has been one of the factors that have influenced the rise in the price of crude oil. Oil companies in Europe have problems and the energy sector in the S&P 500 may have a hard time, as the number of oil installations has increased again. Production in the United States continues to increase and this will force OPEC to maintain the program of production cuts to compensate. We must not lose sight of the fact that the tensions in the trade war could reduce global demand, something that has already been warned by several oil-related organisations. Asian markets traded higher on Wednesday, April 18, as investor confidence remained strong following the Wall Street rally with good business results. In Japan, profits were widespread, with retailers, utilities and technology companies among the up-and-coming sectors. In Korea, gains are seen in the manufacturing and intermediary sectors, among others. Bank stocks rose after the Chinese Central Bank announced on Tuesday that it was cutting the reserve requirement ratio by 100 basis points for some banks. China's cut in its reserve requirement ratio supports risk sentiment, as banks' profits are expected to improve with lower financing costs. Australia's S&P/ASX 200 index rose as the strongly weighted fall in the financial sub-index was offset by observed gains in materials and energy. Asian earnings followed the Wall Street bullish move on Tuesday, April 17, with U.S. stocks extending gains from the previous day, as investors applauded the release of the results. The Dollar rose sharply on Wednesday in Asia as U.S. economic data supported the Dollar against the Yen, and tensions in the Middle East and China's trade relations with the U.S. seemed to be taking a back seat. The Dollar index rose to 89.53. Oil prices rose on Wednesday. They have been driven by a drop in crude oil inventories in the United States and the risk of supply disruptions from the Middle East situation. Gold prices fell back on Wednesday after three consecutive trading sessions. The Dollar continued to strengthen as U.S. equities rose, boosting risk appetite. Nevertheless, China's announcement of new tariffs on U.S. imports recalled that the risk of a trade war is still alive. With regard to the United States, good news for the real estate sector on Tuesday, April 17, because both housing construction and building permits are better than expected. In addition, industrial production has hardly changed in the year-on-year and remains at around 4.3%. The International Monetary Fund has raised growth forecasts for virtually all major countries or at least maintained them. If we add to this some comments from the People's Bank of China, saying that they will reduce reserve requirements for banks and increase financing for small and medium-sized enterprises, then there is calm for greater support for the economy. The political temperature drops and the season of results prevails. A bullish session in European markets on Tuesday 17 April, thanks to the fact that there has been greater calm in the major areas of concern, which are the tension in Syria and the commercial area. The economic sentiment data from the ZEW Institute in Germany was a major setback. The reading has been at its lowest level since the end of November. The economic sentiment survey created by the ZEW Institute in April is a major scare. From the previous month's reading of 5.1 to -8.2 this month. It's much worse than expected to be negative, but only -0.8. This is important because the deterioration in confidence is too great. The trade situation has damaged business confidence and now the German Foreign Minister is speaking out and saying that Europe must avoid an escalation of the trade dispute with the United States. In addition, he says that Germany has a special role to play in providing a window for dialogue with Russia. It is the best in Europe, with an improvement of almost 0.9% thanks to the news that China wants to open up its automotive market even further. It will also remove the limit on investment and ownership in local companies by 2022. It is open to a lot of foreign capital and also to collaborations with companies in the country, so there is a lot of room for other brands, particularly European ones. This prospect of having a greater presence in the Chinese market, which also leads to investments and sales, is very much encouraging the situation in Germany. Emmanuel Macron has attended the European Parliament in Strasbourg for the first time as President of France. The French leader's speech has two important messages: one explicit, which has been heard, and the other implicit, which has been understood. The UK unemployment rate in February fell to 4.2%. It is one tenth lower than the previous one and also better than expected, which was unchanged. However, the unemployed are back on the rise again. They do so from the previous 15,100 to the current 11,600. It's less than the 13,300 expected. The average wage in February accelerated to 2.8%. This is expected, from a growth of 2.6%. However, if bonuses are included, it remains at 2.8%. Two tenths below the expected increase. One of the things that are hurting the economy is precisely that wages are not growing as much as inflation. Asian markets rose modestly on Thursday, April 19, amid improved investor sentiment and after U.S. stocks made gains in the last session. In Japan, the materials sector contributed to the gains. The Kospi held firm as the session progressed amidst the gains of steelmakers and the manufacturing sector. The technological actions were mixed. In China, the energy sector grew as large oil producers benefited from the rise in oil prices. In Sydney, the S&P/ASX 200 reflected the rise in the materials sector, following gains in the metals markets due to concerns about Russian sanctions. The upward movement in Asia followed the improvement on Wall Street, where strong earnings continued to drive markets. According to congressional advisers, who have been briefed by the Trump Administration, the goal now is to reach an agreement with Canada and Mexico on the North American Free Trade Agreement in the next three weeks. The Dollar held steady against most of its major currency rivals on Thursday, as long-term U.S. Treasury yields benefited from the improved risk appetite. In the Asian session on Thursday, oil prices remained close to their highs reached at the end of 2014. They were achieved during the previous session, due to the fall in US crude oil inventories and the fact that the main exporter, Saudi Arabia, is pushing for prices between 80 and 100 dollars per barrel. Gold prices remained stable on Thursday, as the Dollar remained strong and tensions between China and the U.S. remained under control. The market is being left to entertain itself with other important aspects, such as the results season. IBM and Crude Oil, important factors of Wednesday, April 18. IBM weighs down the Dow Jones of industrials and puts it in the negative. The global economic slowdown, which began last December, together with the weakness of the stock markets and interest rate hikes, are grounds for reflection for authorities and experts. They are also decision reasons for investors exposed to risky assets. The pound plummeted sharply on Wednesday, April 18, as year-on-year inflation in March was worse than expected. The year-on-year increase in wages has outpaced inflation and this is a respite for the UK economy and also a relaxation to raise interest rates. The pound has weakened everywhere and that has exported strength to both the dollar and the euro. There have been other factors that have moved Europe a great deal. 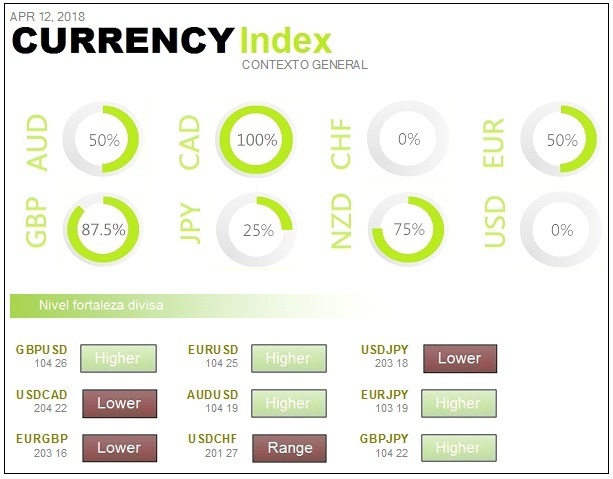 For example, the future of the German index has behaved the worst and, if you look at the market from the inside, you can see that the automotive and parts supersector is the worst of the day. Everyone is monitoring the evolution of the banking regulations that were introduced as a result of the financial crisis. Specifically the Volcker rule. This is the rule by which banks were forbidden to operate with money from their own accounts. It is clear that this prevents financial institutions from assuming more risk, which has a direct implication in economic growth and in financial activity in cases of bonanza. Now we have been thinking about changing the rules that came out of the financial crisis, but it seems that the step has not been taken. If the Volcker rule were to be changed, or even removed, this would be very welcome for the banking sector. It would also help the economy, because it would allow itself to take more risks. However, it would be a situation similar to the one before the crisis, in which a false step would put all the stability of the financial system at stake. The point of focus is that the United States has left it up to the Federal Reserve to decide what to do with this rule. With the Federal Reserve under the influence of Donald Trump, you have to watch what could be an incentive to take more risks again, threatening the stability of the system. Weekly crude oil reserves in the United States are down -1.07 million barrels when a -1.4 percent decline was expected. The descent is less than expected. Good news for the crude oil price, which continues to be encouraged by the rumour that OPEC is looking for a price increase of up to $100 a barrel. Iran wants to pass on the dollar. And for that, from now on, it will offer the monetary reserves figures in Euros instead of Dollars. That's how he disengages himself from the White House, whatever might happen. Crude oil prices are skyrocketing. It rises more than 2% and reaches 68 dollars a barrel, an area not seen since 2014. The final reading of inflation in the euro area in March shows a growth of 1%. It is well above the previous 0.2% and is just as expected. In the year-on-year, we went from 1.1% to 1.3%, although slightly below the 1.4% expected. Watch out for the behavior of crude oil. The underlying, the one that really worries the ECB, is completely stable at 1%. Much relaxation in the pound as the CPI takes a step back and allows wages to improve more than prices. This is a relief to citizens and also relaxes the rush for the Bank of England to raise rates ahead of time. The UK CPI in March decelerated from +0.4% to +0.1%. Far from the expected +0.3. The year-on-year rate rose from 2.7% to 2.5% and is worse than expected, which was 2.7%. Wall Street's negativity flowed through Asian markets on Friday, April 20, with regional stock market indices dropping moderately amid technology sector downturns. In Japan, semiconductor companies were down, while financial and utilities companies were up for the most part. The region's semiconductor companies declined after Taiwan Semiconductor Manufacturing (TSMC) announced that it was forecasting lower-than-expected revenues in the second quarter. Morgan Stanley attributed TSMC's weak prediction to reduced orders from Apple's iPhone processors. China said it is well prepared to handle any negative effects of its trade dispute with the Trump administration, adding that tariff increases on U.S. imports will not have a major overall impact on its domestic industries. The United States will negotiate a trade pact with Japan that could exempt it from tariffs. It is another sign that Trump is aggressive in forcing negotiations in favour of the United States. Last week, everyone was worried about a military conflict between the United States and Russia. Now the concern is that the recent missile attacks in Syria could lead to clashes between Israel and Russia. There is one asset class that may be of great interest in the current situation: commodities. Geopolitical turbulence and market volatility, which are putting downward pressure on the stock market, are making the commodities market work very well. A very popular commodity index has just peaked in the last two and a half years and the trend continues. The Pound fell to a two-week low against the Dollar on Friday's Asian trading session, following comments by the Bank of England's President and UK retail sales data, but uncertainty about North Korea's, trade policy and the situation in Syria kept many investors on hold. 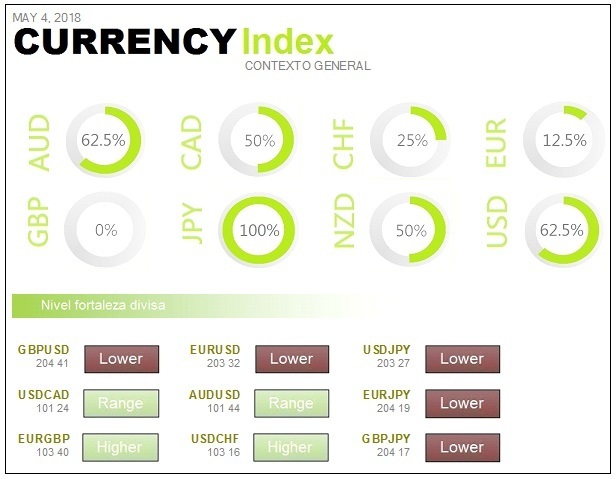 The euro/dollar and dollar/yen could see one of their narrowest weekly ranges in recent months. Investors also focused on the higher yield on U.S. bonds after 10-year Treasury yields rose above 2.9 percent. Oil prices remained firm in Friday's Asian session, nearing their three-year high of earlier this week. Continuous supply cuts, led by OPEC, gradually reduced excess supply. Gold price fell on Friday and has the first weekly drop in the last three weeks. Expectations of higher interest rates in the United States, easing of political tensions on the Korean Peninsula and the situation in Syria weighed on the demand for safe haven assets. The evolution of the market and the season of results are the protagonists. US benchmark crude oil rose 1% on Thursday, April 19, and is already well above $69 a barrel. This is good for the materials sector, the basic resource sector in Europe and also for the oil companies sector. However, the higher price of crude oil, the more inflationary pressures increase, so the secondary debt market is reacting. The Philadelphia Federal Reserve's April manufacturing index improves slightly. The general data seems positive, but if we look inside there are factors that are negative. For example, the upturn in prices paid or the decline in new orders. All of the above detracts from the brightness of the data and is between neutral and slightly negative for the market. Positive for the dollar and negative for bonds. Weekly unemployment claims in the U.S. are almost flat because, from 233,000 last week, we are down to 232,000. It's worse than expected, which was down to 230,000. Data practically unchanged and in minimums of decades. Therefore, the labour market is still no problem for the Federal Reserve, it is still supporting the economy, it is good for the dollar, bad for bonds and should be slightly positive for the market. The European Stock Exchanges, after two trading sessions, took a break on Thursday 19th April and traded unchanged. The Ftse 100, driven by the pound's correction and commodity-linked companies, aims to strengthen above 7,300 points. U.S. President Donald Trump and Japanese Prime Minister Shinzo Abe said on Wednesday they had agreed to intensify trade consultations between the two longtime allies, with an aim to expand investment and trade between their countries. Abe said at a joint news conference with Trump: ‘President Trump and I agreed to start talks for free, fair and reciprocal trade deals’. Oil has gone to several-year highs due to inventory data and Saudi Arabia's statements that it welcomes the fact that oil is going at $100 a barrel. It seemed that the negative catalysts had disappeared but one came back: the fear of inflation. We must not forget that the great fall of February began with a series of macro data that favoured the fear of inflation. The correlation of oil with inflation is total and, if it continues to rise, many traders could become nervous. Metals are rising sharply in Asia and this is good for the basic materials sector. However, it also has an impact on inflation. This is something that usually precedes a very harmful signal, which is the inversion of the curve. However, many people are trying to calm the situation because no reversal of the curve is expected in the current economic cycle. It usually takes a long time between the appearance of flattening and inversion. It cannot be ignored that rates continue to rise and that the 10-year notes in the United States are on track at 2.9%. This will set in motion the increase in rates in the mortgage sector. What initially appears to be favourable for the banking sector is not so for the rest. It is important to be aware of what can lead to higher financing costs and what savers can do with the money they have invested if fixed income begins to offer a more attractive return. On the other hand, Baker Hughes'count of oil installations continues to rise and OPEC appears to intend to extend the agreement to reduce production. It is the demand itself that will end up depleting the reserves and thus put pressure on the price of crude oil to rise to 100 dollars a barrel. Clearly, if this were the case, inflation would wake up and central banks would have to act accordingly. The IMF director identifies high debt, financial weaknesses and protectionism as the main risks to growth. The IMF points to Spain for its debt. If the country were a company, it would have to be restructured to reduce costs. But that would imply a smaller political and administrative class. Most Asian equities traded lower on Monday, April 23, as investors watched US Treasury yields rise and digested falls in technology stocks on Wall Street. In Japan, insurers, banks and shippers were in positive territory, while technology was mixed. In Korea, car manufacturers and retailers fell as steel manufacturers rose. In Australia, the financial sub-index and gold producers led the index's gains. Weak performance in Asia followed the drop in US stock market indices on Friday, April 20, amid a drop in Apple stocks, which pushed the technology sector down. On the other hand, investors also looked at the strong performance of the U.S. economy during the corporate earnings season, with 81.5 percent of the S&P 500 companies posting better than expected earnings on Friday. More than a third of the S&P 500 companies are expected to release their results this week. Also noteworthy was the rise in US Treasury yields, which in turn supported the dollar. The 10-year Treasury bond yield stood at 2.977%. Everyone is sloping the yield curve, as it is flattening out. An investment of this kind could pose serious problems for the evolution of the economy, although this is not expected to happen in the short term due to the current phase of the economic cycle. 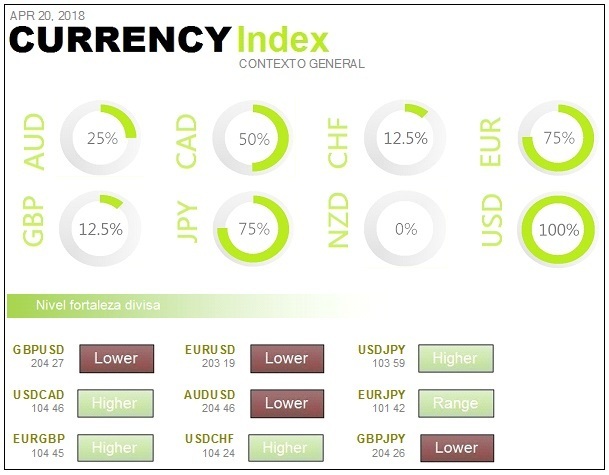 The Dollar rose to a two-week high against most of its major counterparts on Monday in Asia, driven by rising US bond yields, while the Japanese yen was affected by concerns about the global political situation. Oil prices remained stable on Monday. The increase in drilling rigs in the United States pointed to further increases in U.S. production, one of the few factors that can curb the upward trend in prices. Gold fell to a two-week low on Monday, as the dollar rose on the back of rising U.S. Treasury interest rates. Industrial Dow Jones is between General Electric and Apple. They are the two opposite poles. General Electric is the best for results and Apple the worst for Morgan Stanley's target price reduction. The energy sector, where the evolution of crude oil weighs heavily, is the worst sector of the S&P 500. Meanwhile, the 10-year U.S. marks continue to approach 3% and have peaked since March 21 at 2.9362%. The Bundesbank talks about Germany's economy. Weidmann confirms what was expected, looking at the macroeconomic data for the first quarter. He says that the economy in Germany is not going to be so bright, but at the same time he says he sees no reason to think of a turning point. Telecommunications are the stars of Europe for business performance. The telecommunications supersector is the best on Friday, April 20, with a 1% increase, although it has come to be above that level. The 10-year notes are approaching 3% and this means that risk-free investing can become increasingly attractive. Savers are who have the last word. Trump's warning about the high price of crude oil may cause inflation to rise less quickly and this would contain bond yields. The whole market is very fast, anticipating an increase in the likelihood of four interest rate hikes by the Federal Reserve this year. Trump's Twitter attack on high oil prices, saying they will not be accepted, has led to that momentary decline. Crude oil prices reached their highest level since July 2015, reaching almost 75 dollars on Thursday, after pressure from Saudi Arabia and a drop in production led by OPEC. The global oil surplus has been virtually eliminated. That is the conclusion that will preside over the meeting between OPEC and non-OPEC member countries. However, analysts suggest that crude oil could have grown even faster if the U.S. had further reduced its output. A Russian news agency has announced that President Donald Trump has invited Russian President Vladimir Putin to the United States. He did so during a phone call and said he would be happy to see Putin in the White House. RIA Novosti said Russia now expects Trump to officially formalize the invitation. He said he has about 100 million subscribers to his premium service. Also, remember the intention to export products that are purchased in the United States through a new international sales service. It's a wink at Trump to stop him from tickling taxes. The point is that there are so many users that it is clear that this service and this company is an enemy of the retail sector, as we know it, creating more and more unemployment in every area it touches. Asian markets rallied on Tuesday, April 24, despite the fact that the Dow and Nasdaq stumbled amidst a fall in technology stocks and investors were watching interest rates rise. Wall Street also focused on the continuation of the season's results. In Australia, the strongly weighted financial sector rose as the country's major banks showed signs of strength. Analysts at Singapore's OCBC bank announced that market sentiment has been affected by multiple factors. These include higher yields, mixed profits, still strong growth data in the US and the easing of sanctions against Russian aluminium producers. During Tuesday's Asian session, the dollar reached a three-month high after being boosted by the rise in 10-year U.S. Treasury bonds to the psychological level of 3 percent. The US 10-year Treasury yield reached its highest level in four years. They were driven by concerns about the growing supply of government debt and inflationary pressures stemming from rising oil prices. The key level of 3 per cent could trigger a reaction in all financial markets globally. Oil prices turned positive during Tuesday's Asian session, setting new highs that go back more than three years. The palladium sank by 5 per cent, amid the US insinuations that they could ease sanctions against Russia. Gold hit a two-week low as investors focused on high yields on U.S. Treasury bonds. Apple has stood its ground and made things easier in the technology industry. It was the Nasdaq that best behaved in the shared part of Europe with the United States on Monday 23 April. 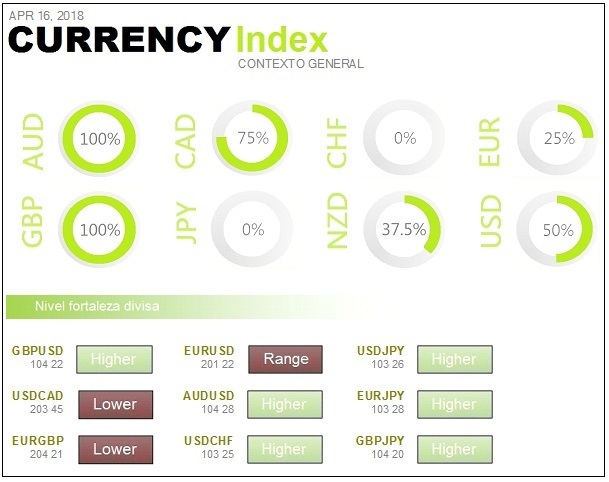 Since everyone was worried about the 3% in the 10-year Treasury notes in the US, the dollar has found itself much stronger, which has exported weakness to both the Yen and the Euro. This weakness of the single currency has supported Europe. The question is that the more profitable the secure assets are, the more savers will switch sides. In addition, refinancing will be more expensive, and so will financing, which should be reflected in consumer behaviour and also in all items that need financing. For example, the real estate market. PMIs have been better than expected in the US, so the US indices have accelerated somewhat since the release. Then they slowed down somewhat, because the Federal Reserve's domestic activity rate in Chicago was worse than expected, although it is still positive. Then the strength returned again, as we saw better than expected growth in second-hand home sales. Baker Hughes' count of U.S. oil installations shows a further increase of five new installations. With this data, crude oil is maintaining the struggle between the cut in OPEC production and the increase in production in the United States. Commodities have not had their day, an effect fully understandable by the strength of the dollar. Gold and silver have been the worst, with decreases of over -1% and -2% respectively. The European Commission has proposed a package of measures to strengthen the protection of those who report breaches of European laws by companies and public administrations. The aim is to create a mechanism to systematize the way in which such complaints are made and to protect the complainant from possible reprisals. US Treasury Secretary Steven Mnuchin said he is considering a possible trip to the Asian giant to try to defuse tensions between the two largest economies in the world. He was cautiously optimistic about reaching an agreement. Apple notes that a small number of computers made between October 2016 and October 2017 have a defective component that causes the battery to expand. Users can take their MacBook Pro to an authorized reseller, retail store, or mail it to an Apple repair center. Those who have already replaced their battery may contact the Company for a refund. Apple points out that any damage that inhibits battery replacement will have to be repaired first and the program does not extend the standard computer warranty. Ronald Reagan had a six-month honeymoon. The percentage gain from the exchanges at that time was approximately 10 percent. Most presidents, after their initial honeymoon, find it difficult to make time to implement their electoral promises. When the honeymoon period is over, presidents often suffer the consequences of a bear market. Most presidents have some kind of difficulty in their second year and Ronald Reagan was no different. Today, although markets have fallen in correction since February, Trump's honeymoon period seems to be still alive. The bad news for Trump is that he is now in his second year in office and the decline could be worse than the bear market that Reagan suffered. Asian markets fell on Wednesday, April 25, after the U.S. stock market fell overnight as investors worried about rising interest rates and economic prospects. Negative sentiment rose after U.S. Treasury bonds reached the psychological level of 3 percent, which led to increased market volatility. The yield on ten-year US Treasury notes reached the psychological level of 3 per cent on Tuesday, for the first time since January 2014. The two-year Treasury bond yield also set a record, exceeding 2.5 per cent for the first time since September 2008. Performance rose shortly after the opening and before turning slightly downward throughout the session. Caterpillar and Amazon are among the many great stocks that were suddenly reversed downward dramatically on Tuesday, April 24. Trump could reach an agreement with the French president on Iran. French President Emmanuel Macron and president Donald Trump discussed this possibility at their White House meeting. In Wednesday's Asian session, the dollar remained stable, just below its four-month high, after US ten-year bond yields reached 3 percent for the first time since early 2014. The fall in Wall Street stocks slowed the pace of the dollar's rally. Oil prices remained stable on Wednesday, but below the peaks of more than three years ago reached in the previous session. The increase in inventories and production in the United States has had an impact. Gold prices rose sharply on Wednesday in Asia, as most of the world's stock markets fell and the U.S. dollar rose to a three-month high. Dow Jones - Nasdaq - SP 500 in short term oversold. Fear is present with ten-year rates at 3%, reached during the session on Tuesday 24 April. 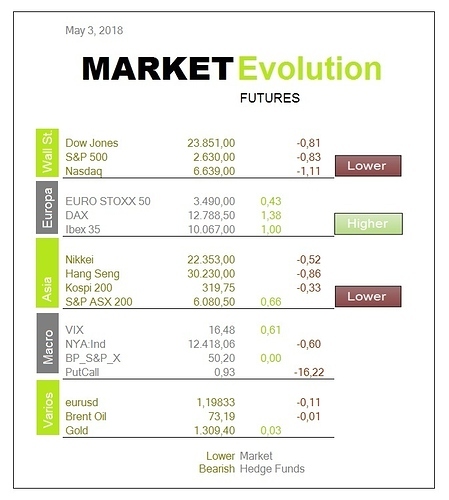 Bearish session in European markets on Tuesday 24th April. It has been a hectic day and, at the end of the day, the fear of 3% has become a reality, making risky assets tremble. A few moments before the opening in the United States, the fateful 3% to ten years was touched. As soon as this happened, instead of a strong Dollar, the opposite happened. Weakness that got from the session lows to the euro. Therefore, it was only with the rise in yields and the unexpected strength of the euro that Europe began to experience problems. The rise in US government bond yields is a constant so far this year, as investors anticipate stronger economic growth in the US and a rebound in inflation. At the same time, the Federal Reserve is continuing its process of monetary normalisation and raising interest rates. The aim is to extend the current cycle of economic expansion as much as possible. At the same time, however, they try to prevent the economy from overheating. The yield on the US 10-year bond has risen by 25% so far this year. On the other hand, the US two-year bond yield set a new annual high of 2.5%. The US 10-year bond yield is to blame for the dollar's rise against all its rivals. The correlation between bond yields and the US dollar has been put back into play. 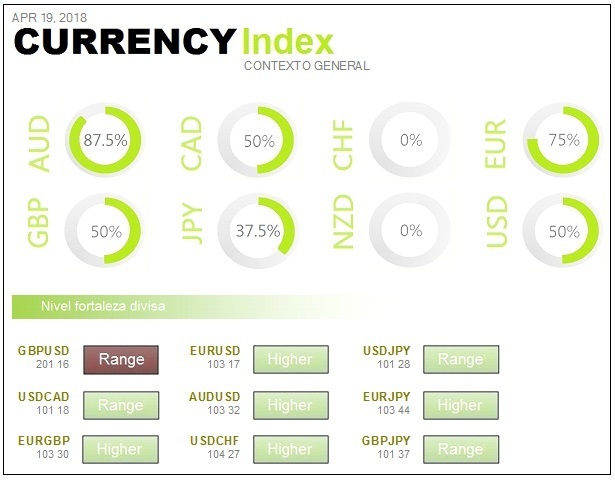 In addition, as the premium between the US bond and the European and Japanese bond has widened, the euro has extended the minimum of seven and a half weeks. The sharp decline in geopolitical risks and trade tensions, which have kept the dollar under heavy pressure in recent weeks, has fueled the long run in the US currency. At the moment, the tension is calming, although the crude oil market is still very much watching for some movements between Iran and Saudi Arabia. Iran has said that, if the price of oil rises, there is little point in continuing with the agreement to cut production. Let us remember that an imbalance in the countries participating in this agreement may cause it to blow up. Between suspicion and suspicion, the reference price of crude oil in the United States is once again approaching 69 dollars a barrel and the Brent is above 75 dollars a barrel. In this context, the energy sector will be one of the strongest sectors. Business confidence fell again in April in Germany. It is doing so for the fifth month in a row, as Europe's largest economy slows down, but remains at a high level. Asian markets were mixed late in the session on Thursday, April 26, following modest gains on Wall Street, where the Dow closed higher for the first time in six sessions. China showed losses in most sectors, including banking, real estate and automotive. Hong Kong's Hang Seng index had declines in banking and technology. Australia's ASX 200 was flat after the market closed on Wednesday for a holiday. While ten-year Treasury notes are hogging all the headlines, investors should look to much shorter-term bonds to find out what's really going on in the markets. The stock market has never shown such low, inflation-adjusted ten-year yields. If there is no major drop, and no deep recession, the same is unlikely to happen again over the next decade. The Dow Jones Industrial Average closed higher on Wednesday, for the first time in six sessions. In the end, he recovered from the heavy losses during the session. Boeing was booming with strong gains, after reporting quarterly results that exceeded analysts' expectations. The stock rally helped the Dow recover and break a five-day losing streak. Meanwhile, the NYSE suspended trading of Amazon and Alphabet because they reached the $1,000 per share ceiling. 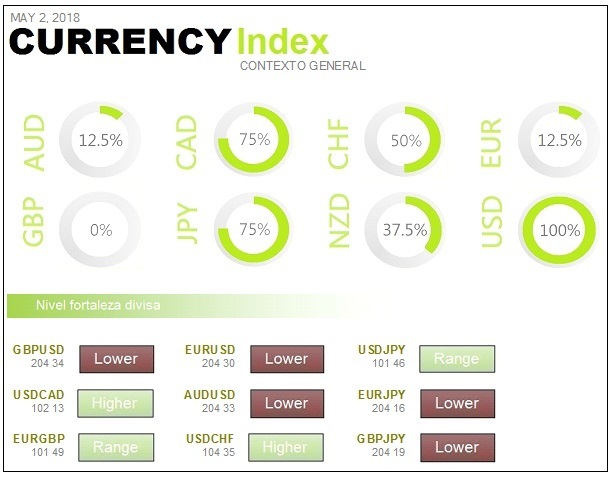 The US dollar and euro remained unchanged. 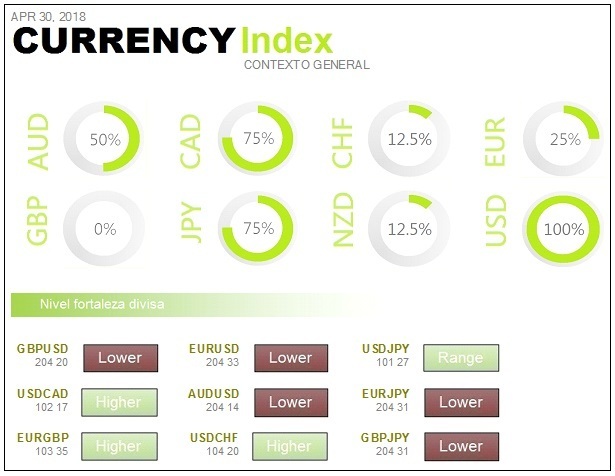 The dollar index reached a three-month high against a basket of major currencies. Oil prices rose sharply on Wednesday, but the U.S. data showed a rise in inventories and production. Cuts in OPEC producers, continued growth in demand, geopolitical tensions and a favourable structure in the futures market have attracted record investment in this sector this year. Gold prices fell on Wednesday, while the Dollar and Pound benefited from the U.S. economic data. Wall Street recorded sales on Wednesday, April 25, for the second day in a row, while continuing to look sidelong at the bond market. The New York Stock Exchange closed at a loss last Tuesday after the 10-year US bond yield exceeded 3% for the first time since January 2014. Another negative session in European markets on Wednesday 25 April. An interview with two relevant persons from the European Central Bank has been published. They have made it clear that inflation must be prepared for and that it is time to show a transition out of the quantitative programme. In addition, the ECB's favourite inflation outlook indicator has risen again, so there is a sense in the environment that future growth will be jeopardised, precisely because of the upward movements in central bank interest rates. The secondary debt market is already warning. There is also the bad performance of the German economy in the first quarter and the constant decline in business confidence in the Eurozone. After rising more than 13% in the pre-opening, thanks to the publication of its accounts, Twitter is falling by 4.5% after having lowered its profit forecast for the second half of the year. The technology company recorded a net profit of 60.99 million dollars in the first quarter of 2017, compared to losses of 61.55 million dollars in the same period of 2018. For the first time in its history, it has two consecutive positive quarters. Weekly crude oil reserves are up 2.2 million. That's more than the expected 2 million. Weekly gas reserves are up 0.84 million. More than the expected improvement of 0.6 million. Weekly distillate stocks are falling by -2.6 million. This is more than the expected drop of -0.9 million. This is the fifth consecutive month, as Europe's largest economy is slowing down, although it remains at a high level. The government deficit remained unchanged in the euro area in the fourth quarter compared with the third quarter. Government debt fell by 1.4 percentage points to 86.7% of GDP. These are data from the Community Statistical Office Eurostat. Asian markets traded higher on Friday, April 27, with investors watching for developments in the talks between the two Koreas. North Korean leader Kim Jong Un met with South Korean President Moon Jae-in at the inter-Korean summit. The Bank of Japan kept its monetary policy unchanged, leaving short-term interest rates at -0.1 percent. The central bank said it will buy Japanese government bonds to keep the 10-year bond yield around zero percent. Asia's gains came after Wall Street rose during the session on Thursday, April 26. The U.S. market advanced strongly, driven by the quarterly results of the main U.S. companies. The Dow Jones Industrial Average closed 238.51 points higher, with Visa as the highest-performing stock in the index. The S&P 500 closed at 2,666.94, with the technology sector being the best. The Nasdaq compound went up to 7,118.68. 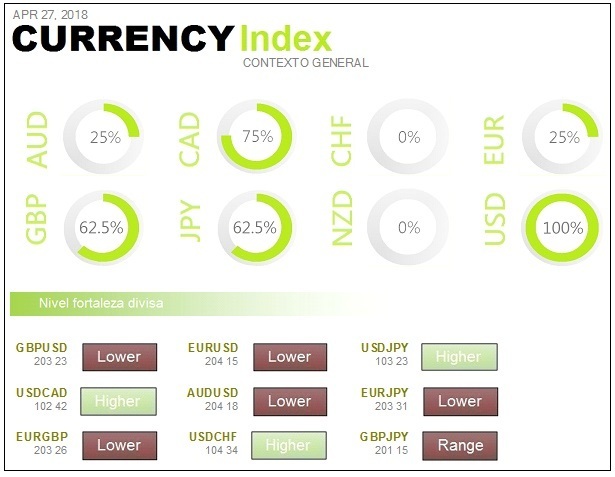 The EUR moved in a wide range on Thursday's Asian trading session after the European Central Bank (ECB) kept interest rates unchanged, as expected. The common currency traded down 0.46 percent against the dollar at the end of the session, after trading higher earlier in the day. The ECB also reaffirmed its current monetary policy stance. Oil prices fell on Friday, but the Brent largely maintained the gains of the previous session amid concerns that Iran may face further sanctions. Concerns about rising U.S. government debt supply and inflationary pressures, driven by rising oil prices, have pushed ten-year bond yields above 3 percent for the first time in four years. Gold fell to several week lows on Thursday, while U.S. bond yields and the U.S. dollar had a big impact. A breath of fresh air in the entire risk market. Once it has been seen that the ten-year bond yield does not exceed 3%, and has even been placed slightly below, this has given a breath of fresh air to the entire risk market. Draghi said, in his appearance on Thursday 26 April, that there is some moderation in growth, because there are some indicators that have fallen unexpectedly. He remains convinced that growth is expected to be strong, that inflation will remain close to the target and expects it to remain at 1.5% for the remainder of the year. Central bank behaviour is one of the factors driving the currency cross, and the Federal Reserve is raising rates while the European Central Bank remains idle and holding negative rates. Next week will be the May Federal Reserve meeting to digest and assess the impact of the recent rate hike. No rate changes are expected this time, but they are expected in June. It's Amazon's turn. The e-commerce giant is the protagonist because it presents its results for the first quarter. These results will be conditioned by the high valuation of its shares, after rising 60% in the last year, to $1,455. The FactSet consensus still gives it an upside potential of 16%, up to $1,700, but market demand is growing with the company founded and led by Jeff Bezos. Amazon is currently the third most valuable company in the world in terms of market capitalization, behind only Apple and in a tough battle with Microsoft. Investors are increasingly demanding better results and growth forecasts to justify such a high value. Everyone counts on interest rate cuts as a tool for dealing with crises. There are already many comments that say that rates are too low in the event that a situation arises that makes it necessary to manage them downwards as help. This means that, if rates are very low, they will not be able to lower them much further in the next crisis. If the balance sheet is too large, central banks will not be able to buy anything else. The current way to raise interest rates is not easy. The sharp decline in the euro-area composite purchasing managers' indices since the beginning of 2018 is not helping. The sharp decline in business and consumer confidence during these months is not helping either. Consumer confidence, calculated by GfK, rose from 10.9 to 10.8 in May, just as expected and almost flat. It is at a peak since the crisis and has started the year quite stable, more or less as we finished last year. That means be on the lookout for a descent. If it was placed below 10 points would be bad news. The unemployment rate in Spain in the first quarter of 2018 rose from 16.55% to 16.74%. It's a lot worse than expected to continue the descents. Seasonality still prevails, so in a sense there is no danger at the moment. The important thing is that it starts to fall again for the summer. In February, Spain's public deficit, excluding local councils, was 0.82% of gross domestic product. Asian stocks rose on Monday, April 30, the last trading day of the month, as investors focused on a mix of declining geopolitical tensions, solid earnings and economic data. In South Korea, profits are seen in steel mills, automakers and oil-related stocks. The technology was mixed. The Japanese and Chinese markets closed on Monday. The S&P/ASX 200 rose by 0.43 percent as the heavily weighted financial sub-index advanced, reversing declines in the materials and energy sectors. Nearly 80 percent of the 276 S&P 500 companies that had posted results as of Friday exceeded expectations. First-quarter revenues are expected to increase by 24.6 percent compared to last year. The Stoxx 600 index provisionally closed 0.2 percent higher, with most sectors and major European stock exchanges in positive territory. European technology stocks led the way in earnings, with a 0.8 percent rise amid good business performance. The Dollar held steady against most of its major counterparts on Monday, after peaking at three and a half months at the end of last week, influenced by a decline in ten-year US Treasury bond yields. The dollar index was 91.51 below Friday's high and at its highest level since January 11. Oil prices fell on Monday as rising inventories in the United States pointed to higher production. Nevertheless, prices are still close to their three-year highs and are on their way up for the second month in a row. Gold rose sharply on Monday as the U.S. dollar remained stable following a 10-year decline in U.S. Treasury bond yields. The United States outperforms forecasts and grows by 2.3% in the first quarter. The world's leading economy grew by 2.3% year-on-year in the first quarter of the year, below the 2.9% expansion recorded in the last quarter of 2017, but above the 2% growth expected by Wall Street. The Nasdaq's in trouble and it goes negative on Friday, April 27th. If it now gets into trouble, the market may think it's time to get out for fear of further regulation of the sector. Consumer confidence at the University of Michigan is dropping. End consumer confidence in April fell from 101.4 to 98.8. It's better than expected, it was 98. Positive session in Europe but disappointing in the part shared with the United States. Continued bad behaviour on Wall Street is often bad news for Europe. On Friday 27 April, Europe benefited from the fact that the slowdown that the European Central Bank was talking about was also felt in the United States. After announcing their accounts, Amazon's titles are slowing their progress after surpassing previous record highs at the opening and setting a new record of $1,638.10. The title has managed to halt the falls in those price levels that at the time functioned as resistance. Needless to say, if it were to close above the previous highs, it would be placed on an absolute free rise. The two Koreas pledge to cooperate to establish a permanent peace on the peninsula. They also pledge to open talks with the United States to sign a final peace treaty to replace the armistice between Pyongyang and Seoul. The United States will maintain the exemptions from EU steel and aluminium import duties if there are concessions from the Brussels authorities. Larry Kudlow, the White House's chief economic adviser, has said so and is in line with Trump's strategy of lobbying for new trade agreements. First-quarter GDP growth was 2.3%, three tenths better than expected. It goes from 2.9% to 2.3%, a rather significant downward revision. Either way, it's the best start to the year since 2015. Consumer spending reduces the expected improvement considerably, from the 4% expected to an increase of 1.1%. The ECP remains at 2.7% growth, which is better than expected at 2.6%. This is good news for the economy, as consumer spending continues to grow but the slowdown has been strong. Very good news for the dollar, because of this increase in the PCE, bad news for bonds and slightly positive news for the market. On Wednesday, May 2, the Asian stock market was affected by the mixed closure of Wall Street and the reopening of several markets in the area after the holidays. In Japan, car manufacturers were on the decline. In North Korea, the actions of the manufacturing industry and car manufacturers lost ground. In Australia, the industrial and information technology sectors won. The warm moves in the early part of the Asian session came after a mixed session on Wall Street, with the Nasdaq moving higher as Apple's stocks jumped above expectations, with the results released after the market closed. The Dow Jones Industrials finished the day slightly down. Nearly 80 percent of the S&P 500 companies that had reported first quarter results before Monday had exceeded expectations. Investors are now focusing on the Federal Reserve meeting, which ends on Wednesday. The Dollar rose to a four-month high against most of its major counterparts on Wednesday, boosted by the outlook for a strong U.S. economy, rising yields and signs of a slowdown in the rest of the world, especially in Europe. Oil prices rose, driven by concerns that the U.S. may again impose sanctions on its main exporter, Iran, despite rising U.S. reserves limiting profits. Gold prices rose sharply on Wednesday, after falling almost 1 percent in the previous session. Wall Street closes a very volatile April with slight monthly rises. Wall Street ended the session on Monday, April 30th with losses, although it closed the month of April with slight gains after the great volatility that has been recorded. Now, the New York Stock Exchange is preparing for a new week of business results, marked by the Federal Reserve's monetary policy meeting. The session on Monday, April 30th, was not very active due to the festivity of May 1st. Traders have been swept away by the day's events, from some macroeconomic data on inflation to corporate trading. The world's largest publicly traded company is accountable to the market on Tuesday after Wall Street closed, and analysts say its latest smartphone has not lived up to expectations. The technology company led by Tim Cook already halved its iPhone X production target for the first three months of 2018 at the end of January. The main reason for this decline was that sales estimates were lower than expected at Christmas time in Europe, the United States and China. Some consumers of the Asian giant are avoiding the iPhone because it is expensive, which would be causing local rivals like Oppo or Vivo to gain market share. The Federal Reserve is about to become more aggressive and ‘collateral damage’ is possible. As for the U.S. Central Bank meeting this week, the market consensus is not expecting any significant movement. It is likely that the FOMC members will discuss the recent surge in inflation in the US and whether there are reasons to accelerate the process of rate hikes. Experts continue to anticipate two additional increases in 2018. The first of these is at the June meeting and the second in September or December. The European Commission took note of the decision of the US Government to extend the tariff exemption for European imports of steel and aluminium for a further month. They warned that the European Union will not negotiate under threat. The President of the United States has postponed for another month the imposition of tariffs on steel and aluminium on the countries of the European Union, Mexico and Canada. It also exempted Argentina, Brazil and Australia indefinitely from increased tariffs. The excellent results campaign is not moving the market at all and it is clear that it was more than discounted by Trump's tax cut. Therefore, there is still no clear catalyst for purchasing. Records of growth have been broken and not much good has come of it. In any case, we must remember that we have been in a period of blackout of repurchases and these, today, are the main source of entry of money into equities. The market has been negatively evaluating any rise in oil prices for days now. At these levels, it is no longer in the interest of raising it further. Inflation is tightening and companies'costs are rising excessively. The latest rise comes in the face of Israel's continued accusations against Iran over its nuclear programmes. Trump also does not believe that Iran is meeting its commitments in this regard and is a new geopolitical hot spot. Asian equities were mixed on Thursday, May 3, as investors digested the Federal Reserve's recognition that inflation had approached its target. The U.S.-China trade talks are also very influential. In South Korea, banks and manufacturing companies operated mostly downward, while automakers and technology stocks made profits. In Australia, increases are observed in all its sub-indices, with the consumer and materials sectors among the best performing. In China, negativity in the financial and technology sectors weighed heavily. The Federal Reserve's decision to keep interest rates unchanged was welcomed by investors. The Central Bank noted that inflation was beginning to rise. In his statement after the meeting, the Fed chairman said inflation has approached 2 percent. This is an improvement over the March meeting, when the Committee noted that the indicators were still below 2 per cent. Investors had been waiting for the Federal Reserve's statement in search of clues about the outlook for inflation and the economy. Oil prices fell in the early hours of Thursday morning. They have been driven by rising oil inventories and record weekly production in the United States. This is counteracting the efforts of the OPEC producers' cartel to reduce supply and underpin prices. Gold prices rose sharply on Thursday's Asian trading session, as investors looked forward to the start of negotiations between China and the US. The Federal Reserve decided at its third meeting of the year to keep interest rates unchanged. They will remain in the range of 1.5% and 1.75%. Powell has followed market forecasts on Wednesday, May 2, and will wait until June to raise interest rates in the United States. Annual inflation is expected to approach the 2% target in the medium term. Technology in the United States has proved to be strong. Apple jumped more than 3% after the results presented after Tuesday's close. The most relevant thing in the market in general has been the repurchase of shares. On the other hand, the yield on the 10-year bond remains above 3%. A new term of debt issuance in the U.S. Treasury is opened to finance the astonishing deficit that will be left by Donald Trump's policy. If we add to this the rise in interest rates of the Federal Reserve cycle, together with the reduction in the balance sheet, we will see that in the coming months and years, debt will be the undisputed protagonist. Inflation is close to the target and does not indicate any intention to deviate from its gradual tightening of monetary policy. Inflation is expected to approach the 2 per cent target. The Committee expects that economic conditions will evolve in such a way that they will justify further gradual increases in interest rates. Signs of rising inflation are likely to cause the Central Bank to raise interest rates again later this year. The forthcoming increases have far-reaching consequences for consumers. For many Americans, raising interest rates is not necessarily bad. The rises are seen as a sign that the economy is working well, which is what helped to revive a wave of bonds, and may lead to further wage increases in the future. Rising rates have also helped raise savings accounts. However, in everyday life, higher rates also mean that you will have to pay more for access to cash, including interest on credit cards or home equity mortgages. The big companies on Wall Street and around the world seem never to fail. The cash they generate is an example. The sum available from Facebook, Amazon, Apple, Netflix and Google (FAANG) is currently 285.625 billion. The unemployment rate remained stable in March at 8.5% in the euro area. No change from the previous month. For the European Union as a whole, the figure remains unchanged at 7.1%. GDP in the euro area expanded by 0.4% in the first quarter, slowing down its growth rate. Asian markets are mixed on Friday, May 4, and investors are watching the U.S.-China trade talks unfold. China's markets are mostly down. In Australia, losses are observed in the strongly weighted financial sub-index. In South Korea, there are declines in the automotive and technology sectors. Markets in Japan are closed this Friday for holidays. Former U.S. Ambassador to China Gary Locke talks about the U.S. position in trade negotiations with China and does not believe either side will win a trade war. U.S. stocks are recovering from past sales and strong earnings on corporate earnings are easing geopolitical tensions. The Dow Jones Industrials erased a loss of nearly 400 points on Thursday afternoon. Good business results helped the index break a four-day losing streak. The Nasdaq was boosted by the rally in Amazon and Apple shares, as well as a 0.6 percent gain in the software giant Microsoft. Traders are now focusing on the U.S. employment data, which will be released on Friday. The April report is likely to highlight the strength of the labour market. The Dollar held steady against most of its major counterparts on Friday, after peaking at a four-month high. Oil prices rose on Friday, expanding on the modest gains of the previous session, as geopolitical risks are looming from possible new U.S. sanctions against Iran. Gold prices are unchanged on Friday and the release of the U.S. Employment Change report is expected on Friday. Wall Street rises losses and falls more than 1% after Fed meeting. Strong sales of over 1% on Wall Street on Thursday, May 3. It comes after Wednesday's falls, following the Federal Reserve's decision to hold interest rates steady. In addition, investors are awaiting negotiations on a trade agreement between the United States and China. In fact, both countries have been negotiating in secret since the beginning of the tensions. These negotiations are now being made public through this trip, which will take the form of a two-day meeting, on Thursday and Friday, between officials from both countries. They have reached 211,000 since 209,000, although they have fallen below the 225,000 expected. In addition, continuous requests have dropped to 1.75 million, below the 1.83 million anticipated. Both data continue to indicate a strong U.S. labour market. Looking ahead to Friday, the NFP, the week's most important publication, will be released. The consensus expects the creation of 192,000 jobs and a drop in the unemployment rate to 4% from the previous 4.1%. Investors will be more vigilant about wage developments, however, as one of the fears is that inflationary pressures on wages may occur. The forecast expects a 2.7% year-on-year increase in average hourly wages. The annual rate of inflation in the euro area in April was 1.2%, one tenth below the figure for the previous month, as a result of the lower rise in service prices. The President of the Bundesbank does not foresee the end of the economic boom in the eurozone, even though there has been some moderation. In addition, he believes that interest rates could start to rise in mid 2019. Whatever they are buying is not from the United States, said Soren Schroder, CEO of New York-based Bunge, the world's largest oilseed processor. They're buying beans in Canada and Brazil, very deliberately they don't buy anything from the United States. It had been extended that Brazil would be permanently exempted from tariffs on steel and aluminium. The White House alleged that it had reached a preliminary agreement in this regard. However, in that country, they say that there are still no definitive and concrete agreements. The Asian markets rose slightly on Monday, May 7, while oil prices are above the $70 a barrel mark for the first time since 2014. In Japan, gains in the mining and oil sub-indices were offset by losses in the financial and technology sectors. In Hong Kong, the three most weighted sectors of the index inversed the initial losses to trade on positive territory. Profits were led by the energy sector. In Australia, energy and materials rose and the financial sector, which was heavily weighted, also showed an upward trend. On Wall Street, equities rose as traders didn’t react with the monthly employment report figures. The unemployment rate fell to 3.9 in the U.S., while nonfarm payrolls rose more than expected. Non-farm payroll data is particularly important to assess the health of the U.S. economy and to anticipate rate hikes by the Federal Reserve. At the same time, Apple's shares reached their all-time high. In European equities, Ferrari led the way in earnings and the price of its shares reached an all-time high. They do so after showing better than expected gains, which led to a series of rating improvements for the car manufacturer. Stocks were up 7.7 percent. The U.S. dollar remained close to its 2018 high on Monday after U.S. employment data failed to dampen the perception of strength in the U.S. economy and even though concerns about trade disputes. On the commodities front, oil prices extended their gains, after stabilizing about 2 percent higher during the last session. Monday's spikes came as markets focused on both the possibility of the U.S. re-imposing sanctions against Iran and the economic crisis in Venezuela. The reinstatement of sanctions against Iran, which is currently the third largest oil producer in the Organization of the Petroleum Exporting Countries, could result in the reduction of up to 1 million barrels of Iranian crude oil per day. Gold prices rose to a one-week high on Monday, while the Dollar fell from its previous session high this year. The figure for job creation in the United States has cast some doubts. The creation of non-agricultural employment rose by 164,000 new jobs in April. It's well below expectations, which were 192,000. The labour force participation rate falls slightly from 62.9% to 62.8%. The unemployment rate falls from 4.1% to 3.9% when 4% was expected. Most importantly, hourly earnings of workers rise +0.1% when expected +0.2%. Initially, the data from Friday, May 4th, caused weakness in the greenback, but everything seemed to be offset by information about the Warren buffet had been buying stocks like Apple, which has created new highs. In addition, Donald Trump has had slightly positive words about China and has announced that there is now a date and place for a meeting with North Korea. One of the most worrying geopolitical hotspots is deactivated. Macro data in Europe were not as positive as expected. 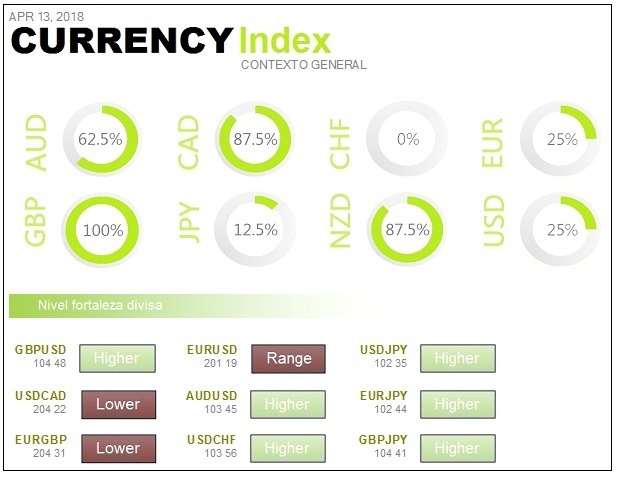 A positive session in Europe on Friday, May 4, where the European Central Bank has released macroeconomic data that is not as positive as it would like it to be, creating downward pressure on the euro. It continues to show the strength of the labour market in the world's largest economy. The creation of non-agricultural employment rose by 164,000 new jobs in April. It's well below expectations, which were 192,000. The president of the United States has decided to reduce the military force in the area, in view of the possibility of agreements to reduce tension. He has ordered the Pentagon to study a reduction in the 28,500 American soldiers stationed in South Korea, according to The New York Times. Apple shares closed with a record high on Friday, May 4, surpassing their previous high of $183.50 per share. They were driven by the news that Warren Buffett's Berkshire Hathaway bought 75 million shares in the first quarter. The legendary investor revealed his company's massive participation in Apple and said that iPhone X sales in the short term had nothing to do with the action taken. The Spanish Minister of Economy, Román Escolano, has stated that the implementation of the new tax on digital services aims to solve a problem of distributive justice. The current contribution to the public coffers of the technological giants is extraordinarily low. In principle, the measure is taken without taking account of Community directives. Asian markets rose on Tuesday, May 8. Meanwhile, oil prices fell following President Donald Trump's announcement that he would take a decision on Iran on the same Tuesday. In Japan, the mining and oil sectors were down. In Hong Kong, the energy sector was among the best performing sectors in the morning and the financial sector, which was heavily weighted, also posted gains. In Australia, finance was leading the way. U.S. stocks closed slightly higher on Monday, as technology companies recorded a winning streak that has lasted three consecutive days. 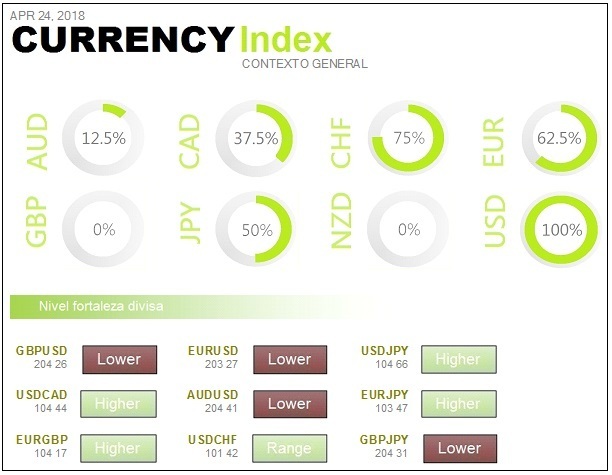 However, the major indices closed below the day's highs after President Trump tweets that he will announce his decision on the deal with Iran on Tuesday. The U.S. dollar peaked at a four-month high, driven by Treasury yields and the strength of the U.S. economy. Meanwhile, the euro and the Argentine peso fell sharply. Trump says he'll announce his decision on Iran on Tuesday. This has pushed oil prices down. It now faces the decision to continue to curb Iran's oil exports or to re-impose economic sanctions in their place. Re-imposing sanctions would jeopardize the nuclear agreement and place the United States in diplomatic collision with some of its closest allies and trading partners. The decision has implications for the oil market because Iran is OPEC's third largest oil producer. Uncertainty surrounding the agreement has boosted prices in previous weeks. In fact, U.S. crude oil now exceeds $70 a barrel, for the first time since November 2014. Gold rose slightly on Tuesday after falling from its previous session, while the dollar remained stable after reaching its 2018 highs. Buffett believes the economy is growing faster than the 2 percent announced. According to him, there is no way to calibrate it and the U.S. government has its own problems with seasonal adjustments in the first quarter. The other point of attention on Monday, May 7, is the price of crude oil, which is already above 70 dollars a barrel. Donald Trump does not want the price of oil to reach $100 a barrel, something that Saudi Arabia does want. Europe shows signs that the start of the week will be similar to last week's. On Monday, May 7, the eyes are on technology. Specifically at Apple. It is not so much its results, where the technological services part is gradually gaining ground, but the news that Warren Buffet has been buying shares throughout the first quarter to achieve a significant participation. The U.S. continues to push to counter the rise in crude oil prices. Right now the price is over $70 a barrel. This is very bad news for American families because the more they have to spend on filling up their fuel tanks, the less money they will have to spend. Donald Trump is fully aware of this and says he will fight Saudi Arabia's intention to raise the price of oil to $100 a barrel. Getting tension into Iran, for a possible way out of the nuclear agreement with this country, is not the best way to do this. However, the United States is doing the rest to increase production. Baker Hughes' count of oil installations shows an increase of 11 new installations. This brings the difference from last year to 155. This should hurt the price if geopolitical tensions disappear. The results do not move the prices in the short term, as surprising as it may seem. It is quite surprising that the economic authorities in the eurozone remain unmoved by the rain of bad macro data that is emerging. However, it is still said that monetary policy measures are coming to an end. German factory orders fell by 0.9% when +0.5% was expected. At the same time, the Sentix sentiment indicator for the eurozone has also been significantly worse than expected. At least the season of results is good. Surprisingly, the political situation in Italy was the big problem for Europe. However, this is no longer the case. 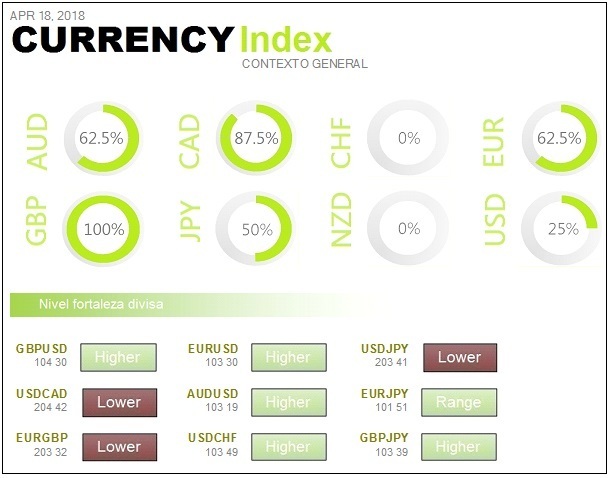 In fact, the stock markets have completely ignored the election result, and the uncertainty it entails, to such an extent that the Italian MIB is the best European index of the year. Short-term risks to macroeconomic and political developments appear to be contained. However, medium-term challenges stemming from high government debt and low growth potential remain. Apple's shares could again be under surveillance after Buffett said he would buy more shares at the right price. He revealed Friday that Berkshire had bought 75 million more Apple shares during the first quarter. Berkshire will make about $700 million a year on dividends alone. In addition, Buffett said long-term investors in Apple's stock should not be obsessed with short-term iPhone sales. Asian action was apathetic on Wednesday, May 9, following President Donald Trump's announcement that the United States would withdraw from the nuclear deal with Iran. In Japan, most sectors traded on negative territory, although gains were seen in the oil and mining sectors. In South Korea, despite the overall decline, gains were seen in oil refineries. In Hong Kong, amidst a rather flat situation, the energy sector rose by 1.49 per cent. In Australia, the falls in the heavily weighted financial sub-index were offset by gains in most other sectors. President Donald Trump announced May 8 that he would remove the United States from the nuclear deal with Iran and reinstate far-reaching sanctions aimed at separating Iran from the global financial system. ‘We are going to impose the highest level of economic sanctions. Any nation that helps Iran in its search for nuclear weapons could also be strongly sanctioned by the United States’. Leaving the agreement fulfills one of Trump's campaign promises, but threatens to force relations with some of his closest allies and disrupt a major source of oil in the world. It also gives Iran the option to expel the inspectors and resume the nuclear activity it had agreed to suspend. The US withdrawal from the agreement could accentuate already strained diplomatic relations with several key allies, including EU leaders in Germany, France and the UK. President Emmanuel Macron of France and British Foreign Secretary Boris Johnson implored Trump to remain within the historic agreement negotiated under President Barack Obama. The dollar held steady against the euro on Wednesday in Asia, while concerns about the political situation in Italy were also strong. Oil rises 2.4% higher after Trump announced the withdrawal of the US from the agreement with Iran. Leaving the agreement could also have a domino effect on the oil market, given Iran's role as OPEC's third largest oil producer. Although the Brent crude oil has experienced a strong rebound in recent days, the severity of any sanctions could affect the fluctuations of the crude oil in the coming weeks. Gold prices rose Tuesday when President Donald Trump said the United States would withdraw from the nuclear deal with Iran. The decision to abandon the deal could increase risk aversion in the markets in general, which would help gold which is seen as a safe asset that maintains its value in times of geopolitical turbulence. Crude oil plummeted on Tuesday, May 8, due to reports that Trump is not coming out of the agreement with Iran. Crude oil is falling due to less geopolitical tension and risky markets are picking up. The 10-year yield on US Treasury notes is again at 3%. JP Morgan says he sees profitability at 4% and also believes that a recession is inevitable at some point. Donald Trump makes the market nervous again with Iran and Italy too. Negative session in Europe on Tuesday 8 May and could have been worse. Three factors are on the table: First of all, the geopolitical tension with Iran. The second is the political tension within Italy. The third, which includes the other two, the strength of the dollar and the weakness of the euro, which have helped to make the situation not even worse. President Donald Trump is expected to withdraw the United States from the agreement that lifted sanctions on Iran in exchange for Tehran accepting limits on its nuclear program. No matter what Trump says about Iran, China will probably ignore him. Oil futures fell from their three-and-a-half year highs before Trump announced whether the United States would return to imposing sanctions on Iran. Everyone is waiting to see what the consequences will be. Iran has been making statements that make its position very clear. He says that if the United States is not in the agreement, they don't see the point of staying in it. If Iran gets its hands on the nuclear bomb, Saudi Arabia will follow suit and Israel will become very nervous. The consequences of the domino effect are unpredictable. The price of crude oil is accusing the situation and is holding around 70 dollars a barrel. Obviously, if the United States imposes new sanctions on Iran, the crude oil it produces cannot be bought. If the market runs out of OPEC's third largest producer's production, there will be a price increase and the geopolitical danger will increase. Vladimir Putin has begun his fourth term as president of Russia with a commitment to carry out a programme of modernisation of the country. ‘We need progress in all areas of life', Putin said in a speech in the Kremlin after being sworn in for the next six years. In his State of the Nation address in March, Putin already advanced a program of economic reforms. He now states that Russia will continue to defend its interests on the international stage, although he made it clear that its priority is the development of the country. Despite his speech, Putin's opponents and some international analysts have been sceptical and believe that the Russian president will continue to seek conflict with Western countries. The volume of German exports last March reached 116.1 billion euros. This figure represents a monthly increase of 1.7%, but represents a fall of 1.7% compared to the same month last year. Asian markets recorded moderate gains on Thursday, May 10, following the Wall Street rally and with oil prices rising after reaching multi-year highs overnight. The Nikkei 225 was up 0.17 percent at the start of the session. The markets of Greater China traded in positive territory, with the Hong Kong Hang Seng Index rising by 0.97 per cent. Energy sector equities recorded significant gains. The S&P/ASX 200 was up 0.21 percent, as the oil sector contributed to the index's gains after the rise in oil prices. President Trump's decision to remove the United States from the nuclear deal with Iran and reinstate sanctions on Tehran threatens to reopen a latent dispute with Europe and inflame trade tensions with the continent, analysts warn. The story's not on Trump's side. The last time the U.S. and Europe clashed over sanctions against Iran, Europe did not retreat and the United States was forced to back down. The Kremlin has said it is 'extremely important' that Donald Trump and President Vladimir Putin meet to safeguard global stability after the US's exit from the nuclear deal. US markets rose on Wednesday, as energy stocks appreciated on the back of a sharp rise in oil prices. The movement follows President Trump's decision to remove the United States from the nuclear deal with Iran. The Dow jumps over 150 points. The dollar held firm during the Asian session on Thursday, after the 10-year U.S. bond yield rose above the 3 percent psychologically and consumer price data came out, which could lead to the acceleration in inflation. Oil prices continued to rise, after peaking at several years overnight, as investors digested the impact that renewed U.S. sanctions on Iran would have on oil supplies. The gains were also due to a larger-than-expected drop in U.S. inventories. Gold prices remained steady on Thursday, as the dollar and US Treasury yields were strong. Very excited about the new crude oil price increase. The benchmark in the United States is exceeding $70.7 a barrel on Wednesday, May 9 and strongly supports the energy sector and banks. However, signs of increased inflation can do harm in general. Trump has pulled the United States out of the nuclear deal with Iran and no one knows how far-reaching the consequences will be. There is a threat to enrich uranium from Iran and Israel may try to prevent it by military means. Saudi Arabia will not be left behind either. On the other hand, Russia supports Iran, so the domino effect can be really devastating. Seeing weakness in the U.S. is causing some demand for some safe assets, so government debt has not just broken the 3% yield on 10-year bonds once and for all. Positive session in Europe due to factors that are not positive in the medium term. On the one hand, there are the possible immediate effects of the US withdrawal from the nuclear agreement with Iran. On the other hand, there are the consequences that can appear in the medium and long term, which are clearly negative. The market is struggling to digest both perspectives. Iran's crude oil cannot be bought internationally. This is equivalent to a drop in production or more upward pressure on the price of crude oil. It was Scholz who said that it will take time until the effects on European companies of the abandonment of the nuclear pact with Iran are clear. It refers, to a large extent, to the effects of possible sanctions, as they will damage everything contracted after the lifting of the sanctions a long time ago. The ten-year notes are again slightly above 3%. JP Morgan was already talking about rates at 4% and has given a 100% chance that there will be a recession, the question is to know when. With rising interest rates, financing rises and costs rise. That means there are people who may be coming to an area where they can't afford to pay their loans or mortgages. That's exactly what happened before the housing bubble. Weekly crude oil reserves fell by -2.2 million. It is much more than expected, which was a reduction of 700,000 barrels. The International Energy Agency says it is ready to act if there are supply problems. If there are new sanctions on Iran, the oil it produces cannot be bought, so the IEA says it is ready to ensure that the oil market is well supplied. With respect to distillates, the figure is 3.79 million. It is also much more than the expected decline of -1.4. In general, this is positive data for the price of crude oil and stocks may decrease further if sanctions remove Iran's production from the market. It is placed at a six-week high of 132.7 basis points. It looks like the Northern League and the 5 Star Movement are going to make an anti-system coalition. They give 24 hours to 5 stars and the Northern League to reach a government agreement.